As soon as I finished work, I got quickly changed into my Leeds things and headed over the tops to Wakefield from Brighouse as I was driving to the game today. After making good time I picked up my daughter at Junction 39 and although there was some traffic as we pulled off the M1, we got to the ground early enough to get a good parking spot at the garage. As I pulled into the forecourt I was going to go out again and pull in at the side of the pumps but thanks to Paul, I stayed where I was and we parked for free. Because we arrived so early the turnstiles weren’t even open so we headed to the players’ entrance just in time for the team to arrive. Before they got there though, we were asked if we could be filmed for Sky TV. As we said yes they wanted us to do a fist pump so we both automatically did the Leeds salute!! When we were tagged in a photo of it later (this had been played at the start of the game), it was a really good quality photo. The first thing we did was head to the front of the stand to hang my flag up and was allowed to put it on the stairs going down to the lower tier. It wasn’t a surprise to find out a few of the stewards were Leeds United fans though and thanks to all of them who helped me and let me take a photo of my flag. I had a chat to a Spurs fan steward and only moved at the start of the game, heading to my seat. 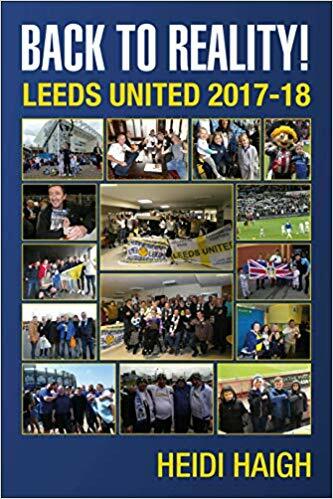 A big thank you to Dawn and Paul for buying my new book Back to Reality, Leeds United 2017-18 for their little granddaughter who attended her first game last week. As always I appreciate the support. The team: Peacock-Farrell, Ayling, Cooper, Douglas, Harrison, Jansson, Saiz, Alioski, Roberts, Klich and Phillips. Sub was Forshaw for Saiz (90). The game ended in a 1-1 draw with Klich getting the Leeds goal with a spectacular strike (62). Attendance was 26,717 with 4,600 Leeds fans. I’m glad I’m on the same wavelength as Bielsa as I’m adamant we have to stick with what we are trying to do. There will be ups and downs but he stuck with the same team again making no changes. After last year’s defeat here and with us losing our first league game, I thought we wouldn’t be making the same mistake as against Birmingham last week. That said it didn’t stop my stomach churning half way through the first half though. The game saw the first half pass really quick with a lot of end to end stuff. Although some of our passing wasn’t crisp enough there were a few nervous minutes before we settled down. Some Wednesday players tried to emulate the Birmingham players by being “injured” on the floor. One of the moves we did though where five of our players were like flies around one of their players and won the ball cleanly, had us shaking our heads with astonishment. For the life of me I couldn’t understand why the free kick was given against us especially as just before that Saiz had been fouled and it was play on. He was playing some fantastic stuff once again and won us a corner. We came very close to taking the lead then with Douglas hitting the post and Phillips having to settle for the rebound being cleared off the line. We started to play really well at that point as we started to put pressure on the Wednesday goal. We weren’t having it all our own way though and Peacock-Farrell was called on to make a good save to deny them a goal. Despite what a few fans around me said, he didn’t stand a chance with the goal they scored just before half time. When the ball was launched into the air it looked like it was sailing over the goal, only to hit the post and go into the net. That was a real downer at the time as it came out of the blue but Cooper brought a save out of their goalie just before the break. Put it this way, I bet if he tried to do that again, he would never score in a month of Sundays! The second half saw me commenting to the lad next to me, that did the photographers in front of the stand to the right of the goal know something we didn’t? There were a number of them who had positioned themselves in front of the Leeds fans, obviously waiting for us to score. We didn’t disappoint them either when Klich went on to equalise with a spectacular goal. Although they had a couple of chances, at times we were camped in their half. What I really liked seeing, was Leeds not letting the ball go out for a throw in but kept the ball in play along with carrying on the attack. What we saw on the pitch at times in that second half was some absolutely brilliant stuff which was fantastic to see. Despite all the pressure though, we couldn’t get a winning goal even though we came close. At times we were like a battering ram and some of the moves were out of this world. I wasn’t too disappointed at the end of the game even though some were saying that we had dropped two points. We may have battered them and only had one goal to shout about, but at one time we would have lost that game so I am happy we got a point and weren’t beaten. The progress we are making on the pitch even with the long term injuries we have bodes really well for the future. With another week ahead where we have three games to contend with, I wonder what will happen this time. One of these days, we will get the rub of the green when we play like we did tonight. See you at Hull – LUFC – Marching on Together!